Eighteen year-old girls, Renee and Elisha Herbert, have been working models since they were 14, and they have slowly but surely made their way into the elite ranks of the young Instagram models of the world. But even though they got started early, they kept a relatively low profile, given that they were still in high school. But ever since they finished high school, they’ve been concentrating on their modeling full time, and their popularity has soared as a result. The world is no stranger to captivating personalities, and the most recent on the list are Elisha and Renee Hebert, 18-year-old twins from the Sunshine Coast in Australia. They have been garnering popularity for some time now, but over the last year in particular they have been skyrocketing in the popularity charts, and people are finally starting to take notice of these two girls. But what is it that these two girls do, you may ask? Well friends, simply put, they are models of extraordinary talent, and of course, winners of the genetic lottery as far as aesthetic physical beauty goes. And after taking a good look at these two, can you disagree? We said that they are models of the highest caliber, but that is true on a number of levels. Not only are they constantly appearing in fashion ads and luxurious photo shoots run by top tier corporations, but they are also Instagram sensations. And make no mistake, those are two completely different things. It’s one thing to be a professional model within a systematic framework where everyone is telling you what to do, but it’s something else when you’re single handedly running your own Instagram page, and thriving in the process. People just can’t get enough of these two, and each of their Instagram accounts have a upwards of 800,000 followers each. But why has it taken so long for us to get to know these girls? Where have they been all of this time? Well, it turns out that they’ve actually been studying diligently in school, like any average teenager should. In fact, they only just finished high school, in 2017 – and ever since, they’ve been touring the entire globe as they self-manage their modeling careers. Ladies and gentlemen, these girls are ready to be seen. They actually first got started when they were at the young age of 14. They had gotten discovered by a modeling agency called Peppermayo, a fashion brand who loved the girls so much that they became the face of their company! Still, their parents made sure that they stayed in school. In those early high school days, they would meet up with Peppermayo about once a week – nowadays, they are free flyers, and have a lot more time on their hands. Nowadays, there are some media personas who are so popular that brands flock to them to advertise their product. In essence, influencers are kind of like their own bosses. They are their own managers, and they pretty much run their own show. With all of the different things that these girls are providing the public, such as their words of wisdom, as well as their mesmerizing modeling photos, it does seem to be a lot to handle for two 18-year-old girls. But they seem to have a good system in play, and a lot of it relies upon communication. For instance, Elisha has stated that her sister Renee deals with a lot of administrative aspects of the business, while she deals with other things. It’s all about teamwork, right? It ain’t easy to break into the modeling scene, as much as people may think otherwise. It’s not enough to just have a pretty face – there are a lot of elements at play, and sometimes any little gimmick can help an aspiring artist move ahead. In the case of these two girls, a big thing that played to their favor was the fact that they were twins. According to Renee, people said, “Omg it’s twins!,” and that immediately gave her and her sister a nice boost in the ratings. There are a lot of different things that people do to make their Instagram images more captivating, and a lot of it has to do with filters. When the twins were asked whether or not filter their images, they responded that they use Snapseed, “to improve the lighting and the saturation.” They also revealed that use the technology of VSCO Cam when they want to filter their stuff. Young aspiring Instagrammers, are you taking notes? The funny thing, each of these girls are talented enough on their own to get all kinds of modeling jobs, but their careers are so intertwined at this point that they are always looking for ways to involve the other. For instance, Elisha revealed that she always feels compelled to let a future employer know that she has a twin, even if she could get the job without Renee. Perhaps she understands the value of a package deal. As they’ve gotten more successful in the modeling industry, Renee and Elisha have been able to be a little bit more picky in regards to who they want to work with. While earlier in their career they may have taken what they can get, now they are in a position where they will only take jobs with creative brands whose styles they identify with. They also prefer companies that are easy to work with – ain’t nobody got time for a brand who will give you a headache. For instance, one of the brands that they’ve very recently collaborated with is Le Tan, a tanning company well known for their various skin tones that they offer. When you take a look at our two beloved twins, it makes sense that they are perfect for Le Tan, because their skin tone is fairly dark. In the words of Elisha, working with Le Tan “really suits our vibe.” We’d have to agree with you on that one, girl. These girls are the epitome of what it means to be a young millennial in this day and age. They say that when they are not modeling, they are doing lots and lots of traveling, an activity that very much suits their lifestyle. They have also said that they are “never serious,” and that with them “nothing is ever planned.” Well, perhaps when you are successful models, these concepts are luxuries you may live with. But while enjoying the luxuries of life while traveling is clearly something that these twins love to do, they are quite content to appreciate the beautiful simplicities of life in their hometown in Australia. A day in the life for them at home can range from something as sweet and simple as hanging out at home with their family and friends, to something as blissful and relaxing as tanning (of course) on a sunny beach. These twins have managed to network pretty well too. According to them, most of their friends at home “aren’t influencers,” but as they’ve been getting more and more well known, they’ve made friends with various influencers around the world. Through the advent of Instagram, they’ve gotten to known different personalities from around the world that are succeeding just as well as they are – and they are probably ecstatic to learn a lot from one another. We’ve already acknowledged that the life of an influencer is pretty cool, because for girls like Renee and Elisha, who just want to live life of the edge and have fun, they can do that by being their own boss. But in their own words, sometimes there are hardships to this method of working as well. When you’re your own manager, you’re kind of an island unto yourself – and sometimes, it can be hard to withstand the pressure on your own. For instance, in almost every industry out there, there is almost always an element of competition. But in a field that every young millennial wants a piece of… a field where you get to create your own hours and live life like a beauty queen. That right there is a world with some of the heaviest competition out there, and can certainly be hard. As Elisha puts it, “girls are really competitive these days.” And we certainly see her point there. We all have our dreams, and sometimes our dreams don’t always go the way we plan them. Interestingly enough, their family is actually very supportive of the girls modeling career. In fact, the girls say that their family is more into it than they are! However, there is one member of their family who is less into their modeling career. And when you find out about who this family member is, you’ll realize that there’s something about these girls we’ve been withholding from you this whole time… These girls aren’t twins… they are triplets! That’s right, Elisha and Renee are actually two sisters that are triplets with a third brother. This brother lives in Sydney currently, studies science, and isn’t such a fan of his sisters’ burgeoning modeling career. Perhaps he wants them to pursue their passion in marine biology, who knows. Either way, it makes sense that the girls are advertised as twins – it’s just a lot more catchy than “two sisters out of three triplets” – are we right? So the twins (sorry, two of three triplets) are rising in the Instagram modeling ranks, and it doesn’t look like they’ll be slowing down any time soon. But what do they see themselves doing in five years time? Well, it turns out they haven’t really decided yet. They’ve decided to take this year to travel the world and figure out if they want to do anything with their lives other than modeling. They’ve even thought about acting – but only time will tell us for sure. Renee and Elisha are not only two parts of a triplet, but they’re also part of a larger family. They actually have not one, but three siblings. After their mother had two children, she wanted to have just one more kid, and ended up having triplets instead! So instead of three children, she suddenly had five of them. The girls actually said their mother cried when she found out, but in the end it all worked out for the best. One of the things these two talented girls like to do in what little time they have to spare, is hanging out with their friends. And if they can, they’ll make a road trip out of it. Renee and Elisha have talked about how much they like being spontaneous, “Just think of things and do it!” So they just think up a place, gather some friends, and go on a road trip to discover new places. Being twins (or in this case, two sisters out of triplets), is one of the most special things about Renee and Elisha, and they definitely celebrate this fact. Not only do they try to spend as much time together as possible, but they also share the experience with their fans. Renee, for example, took to Twitter to jokingly ask her fans, “If Elisha and I married other identical twins and had babies with them at the same time would our babies be…twin cousins?” And we love that sense of humor! Elisha and Renee know to spot a good campaign when they’re offered one, and they couldn’t pass up the opportunity to work with a huge brand such as Calvin Klein. This April, the girls headed to Malibu to model for a Calvin Klein campaign, featuring some of the brand’s undergarment and denim range. Working with such big brands is a major milestone in any model’s career, especially for models who began their way on Instagram. Like many young people today (and young celebrities in particular), these girls didn’t miss the opportunity to hit up Coachella, one of the most famous music and arts festivals in the world, known for the unique outfits and great music. This year, Renee and Elisha gathered some of their friends, to visit the festival and have their own experience of a lifetime. There’s no doubt these girls are living it up and making the most of their lives. When you look at Renee and Elisha’s Instagram and Twitter accounts, chances are high that you’ll see a picture or two of them with some puppies. The girls are apparently huge animal lovers, and they particularly love dogs. They even take to babysitting their friends’ dogs whenever they can. As they’re taking pictures and fawning over those puppies on Instagram, their dedicated followers are fawning over them and their apparent love of these adorable animals. The Herbert twins love to keep in touch with their fans, and so the two paid a visit to Newcastle in March, for a meet and greet with their followers. It wasn’t only a chance for their fans to meet and pose for pictures with their social idols, but also a chance to win something bigger. 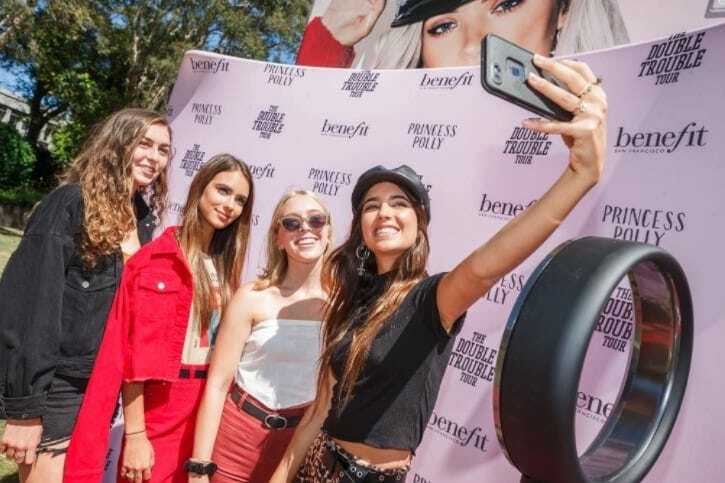 The Double Trouble event, hosted by makeup and fashion brands Benefit Cosmetics and Princess Polly, gave two BFF’s (best friends forever) who attended a chance to do a photoshoot for the brands. Like we’ve already mentioned, the girls definitely know how to keep in touch with their loyal fanbase. Up until a while ago, the girls actually had “Ask Me Anything” pages, which means anyone could ask them any question about any subject, and they would reply. The questions ranged from their opinions on certain people, to their favorite breakfast foods. But with so many followers on Instagram, it was probably hard to keep up with all those questions! Elisha and Renee are definitely savvy when it comes to business – they have to be to run their own modeling and social influencer careers. Another business venture these girls have is selling their clothes online. The girls offer their fans to purchase some of their most beautiful outfits displayed on Depop, giving them a chance to get some of their unique style. It’s another good way of making money, as well as keeping up with their fans. The girls’ love of animals doesn’t stop with babysitting their friends’ dogs, but they also take action by collaborating with the Vetpaw team (Veterans Empowered To Protect African Wildlife). The girls travelled to Africa to help out the organization with preventing illegal hunting of wild animals and even tracking down offenders in order to prosecute them. Of course, the girls rocked some pretty awesome outfits while doing some good for the animals of the world. One of the many advantages of having a twin sibling, is being able to sometimes switch places without anyone noticing. It’s always fun causing a little bit of twin trouble, right? When asked whether or not they’ve pretended to be each other, both Elisha and Renee replied they have indeed done that. They would sometimes switch places in school to back each other up, and one of them even replaced the other when she was supposed to take photos. Even though they’re supposed to look exactly alike, many times there are tiny little differences between twin siblings which allow to tell them apart. So when looking at two identical twins, some people might say one of them is the better looking twin. But when asked whether Elisha and Renee have ever claimed to be the better looking twin, they both replied they would never say that. In fact, they both would call their sister the better looking one! The girls are often asked how come they don’t have boyfriends, and to that they have a simple answer. They describe themselves as independent women, which means they don’t necessarily need a boyfriend to have complete lives. The girls like to send the message that being single is okay, so we shouldn’t let anyone feel bad about ourselves for being single. They also think it’s worth waiting for a partner who makes you feel good about yourself, and that’s a message we can definitely get on board with. These girls’ social media presence doesn’t stop with Instagram and Twitter. The two also have their own YouTube channel, where they upload various videos together for their many followers to watch. Some of these videos follow them as they travel together all over the world, some of them show their many shopping hauls, and some are purely for sisterly fun – like dyeing their hair together or answering questions from their fans. You could definitely tell the two are extremely close, just by watching their videos together. As twin sisters, Elisha and Renee have said that even though they probably spend an extreme amount of time together, doing everything together is their favorite thing about being twin sisters. Since they are such good friends in addition to being sisters, every night feels like a sleepover for the two, and they have a blast traveling with one another. No matters how their careers will develop in the future, there’s no doubt these inseparable girls will always enjoy each other’s company.